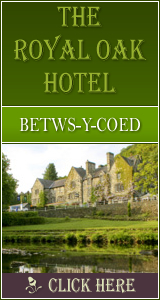 Llangollen: Accommodation, Attractions, Activities, Going Out, Shopping, Things to Do, Places of Interest, Outdoors, Llangollen Holidays, Llangollen Area Location, North Wales. A small town of about 3000 people Llangollen is seeped in myth and legend. It is best known for hosting the Llangollen International Musical Eisteddfod every summer which brings in about 120,000 visitors and turns the town into a vibrant international stage. 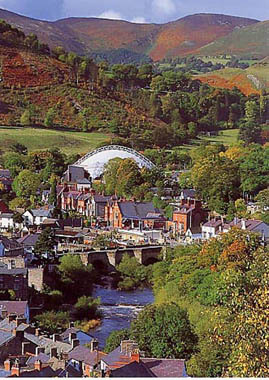 Llangollen offers visitors a wealth of attractions, high quality accommodation, and restaurants. There's plenty of opportunities for walking, riding and fishing. The town itself is home to the Llangollen Railway. You can travel between Llangollen and Carrog on a restored steam engine through eight miles of beautiful countryside. Gales Of Llangollen Llangollen Accommodation, Holiday Accommodation. Llangollen Wharf - Horse Drawn Canal Boat Trips Llangollen Wharf is one of the major attractions in the North Wales market town of Llangollen. From the Wharf you can embark on a horse drawn or motorised canal boat trip along the beautiful Llangollen Canal. Home made fare is available in our cafe with spectacular views from the patio, which overlooks both Llangollen and the River Dee.